I would encourage anyone, Catholic or not, to watch the following film about the facts of abortion which are not under any kind of dispute. Unfortunately, the music which goes along with this video is awful, so I was forced to watch it with the sound turned down. It makes the video no less effective. The Times reports the latest on the Foreign and Commonwealth Office memo scandal. Bishop's involvement in blue, bold. 'The civil servant in charge of the Pope’s visit to Britain has been suspended and is to be investigated for misconduct after a memo lampooning the teachings of the Roman Catholic Church was leaked to the press. I, Laurence, a poor sinner, write as your man in Brighton and urge you, in the name of Christ Jesus, to celebrate St Catherine of Siena's Feast Day by feasting as the Church commands, by drinking some Guinness, smoking some fags and playing some chess, as I am doing. I write this because I'm the third man in this chess tournament and am therefore redundant, receiving not the attention which my soul, steeped in the unruly and ruinous sin of Pride, feels it deserves. Or, I could just be bored as the game is moving at a snail's pace. I have spotted a computer in the corner of the pub which is free to use and so, in the name of Christ Jesus, I have used it so that you may know of my whereabouts for no reason whatsoever, save for the vague and fleeting enrichment of your internet reading and my personal entertainment for just five brief minutes. Today is the Feast of St Catherine of Siena. You can read all her letters here at the site, helpfully titled, 'Letters of St Catherine of Siena'. This is one she wrote to another Larry, this one in Bologna. The site gives a brief introduction and background to each letter and then publishes the spiritual letter in full. St Mary Magdalen Church has a rather lovely statue of St Catherine. How incredible it is to think that this lady, who gave encouragement and advice to a timid and beleagured Pope Gregory XI, aiding his return to Rome from Avignon, was a lay person! The tragic and appalling death of a baby boy who survived an abortion, after an alarm had been raised that he moving is the most read story on The Telegraph website. Yet, none of the columnists or bloggers are touching this story. I hope that atleast one of the Catholic writers there will post on it. No surprises here, but I don't think either the BBC or The Guardian will touch this story with a bargepole, or even report it. Commenters from the public on the Daily Mail site are largely aghast at how this could happen. The fact of the matter is that this happens quite a lot. Babies are left on shelves to die. There should be a full parliamentary investigation into the scandal of abortion in the UK and in every European country, but, of course, that is highly unlikely. There is too much money at stake now for politicans to change the law. Pictured left is Rossano Calabria, where a baby who had survived an abortion was found still alive two days later by a Catholic Priest. The Priest prayed by the body of the baby and realised that the child was moving. It was still alive. The baby later died in intensive care, but the story has sent shockwaves through Italy. The Telegraphreports that on the baby boy abandoned by Italian doctors to die after a botched abortion. The 22-week infant later died in intensive care at a hospital in the mother's home town of Rossano in southern Italy. The mother, pregnant for the first time, had opted for an abortion after prenatal scans suggested that her baby was disabled. However the infant survived the procedure, carried out on Saturday in the Rossano Calabria hospital, and was left by doctors to die. He was discovered alive the following day – some 20 hours after the operation – by Father Antonio Martello, the hospital chaplain, who had gone to pray beside his body. ...well, a little bit sorry for Gordon Brown, in as much as he's a victim of his own isolation as Prime Minister. 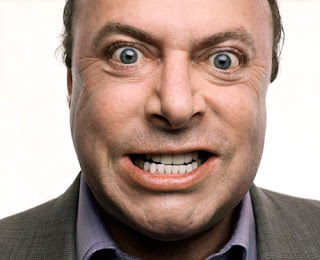 He's surrounded by people who all think about modern politics like he does and he suffers near absolute seclusion from the life of ordinary voters who comprise the rich tapestry of human beings with differing views on election issues in the United Kingdom. Most of us have been two-faced gits at some point, but really and truly, this kind of snide, opportunistic and devilishly nasty behaviour is second nature to politicians, especially, one imagines, major politicians. Perhaps he's been hanging around with Peter Mandelson too much, but I doubt that's the reason. This is how people get to the top. It isn't just Tony Blair who perfected the suave fixed grin and sincere handshake electioneering manoeuvres we all grew to hate, while his heart burned with lust for votes, power and, as we now know, money. He was the arch-politician. 'Catholic Voices' Should Learn from St Paul: "I am for Christ"
Are you for Jack Valero? Are you for Austen Ivereigh? Are you for 'Catholic Voices'? If we are not 'for Christ', as St Paul said, we are for nothing or nobody. If we are not for Christ, we are useless. Mulier Fortis has highlighted an exchange of e-mails which suggests that all is not well with the media team drawn together to defend the Holy Father and the Holy Church by Jack Valero and Austin Ivereigh, 'Catholic Voices'. Take comfort, James Preece and any Catholic bloggers overlooked or looked at and then dropped by the 'Catholic Voices' team, in their search for the fresh Catholic voices of men and women who strive to live the Most Holy Faith and who strive to bear witness in deed and in word to the Gospel of Our Lord Jesus Christ. Did the Foreign Office 'Cover Up' the 'Papal Abuse' Document'? It certainly seems to have 'covered up' for the Papal abusers. Instead of sacking them for cocking up a diplomatic visit by another Head of State, they've 'transferred them to other duties'. Oh boy! This is priceless! Could this be a real 'Papal abuse' cover up?! The Vatican and the Government have been trying to dampen down this story. The Foreign Office, however, haven't helped matters, inflaming the Vatican by insisting that the guilty party concerned in what amounts to yet another 'dodgy dossier' scandal, has been moved on, not to the dole queue, no, but to a different role, presumably in the same department. Oh dear! Pictured left: Me and some friends in Brighton town centre today. Tim Collard, is a 'retired British diplomat who spent most of his career in China and Germany. He is an active member of the Labour Party'. He has written a blog post which is interesting in as much as he tries, desperately and, encouragingly for Catholics, utterly in vain to defend the Foreign Office, for whom he used to work, with a 'You Catholics! You can't take a joke!' angle on the Papal visit document which escaped from the Foreign Office into the hands of the World's media. Oops! We expect spin from Labour and, given that Tim works in the media, now we're getting it from their supporters and activists in the media as well. It is a poor and rather shoddy article and for that reason alone, vaguely amusing. Read it here. He's getting quite a few comments already! Click here for The Telegraph's and here for The Daily Mail's accounts of the shocking level of puerile time-wasting and deep-rooted, vicious anti-Catholicism embedded in the heart of the British Government and establishment. The Guardian certainly didn't go to town on this story, giving it just four small paragraphs. Hardly that surprising, really, given their zealously liberal line on current events and unsurpassed loyalty to the new Labour, secular-state based atheist machine, for whom moral values like 'we shouldn't kill unborn children' are just something about which to giggle inanely during a brainstorming session. 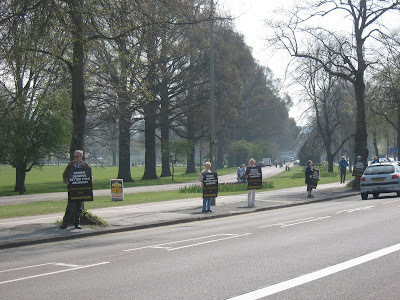 Local pro-life activists and representatives of Brighton's division of the Society for the Protection of the Unborn Child (SPUC) held a 2-hour roadside protest today on Preston Road, Brighton. With the Saturday sun shining and day trippers from South of England and beyond flocking to come to Brighton, parts of Preston Road were gridlocked between 11 am and 1pm, when the protesters arrived for the demonstration this morning. I just happened to be passing myself in the car, so I stopped and took a few photos of these men and women standing up for the unborn. Just before stepping out onto the road to go over to the other side to get a good picture, a car drove by and I heard a man shout out at one of the protestors, "F**k off!" That was only at 11am, just as the protest started, so I wonder just how these brave souls fared for the next two hours. Jack Valero, Head of the new group defending the Church in the media, Catholic Voices, has written a piece in The Times. Many columns have been written about the abuse scandals which have made it onto the front page of various newspapers. He asks the pertinent question. When will public attention turn away from the Church on this issue and onto the families and other institutions within which the majority of child abuse takes place? There is great danger of the Church being made a scapegoat of a society in which the abuse of minors is a very real, ever present danger... 'When I was growing up in the late 60’s and early 70’s sexual abuse of minors by relatives or older friends was not uncommon. But none I knew had been abused by priests; the perpetrators were teachers and relatives. 'Gordon Brown marked St George's Day today by flying the flag of St George over Downing Street. It is the first time in recent years that the flag has been raised at Number 10 to mark the annual occasion. Downing Street has two flagpoles, and the red-and-white banner will fly alongside the union flag. Other UK government buildings in England that have two flagpoles were also encouraged to fly the St George's flag. Where just one flagpole is available, such as the Houses of Parliament, the union flag – which takes precedence over national flags – should be flown. Brown will also fly the Scottish saltire on St Andrew's Day and the Welsh dragon on St David's Day. Northern Ireland does not have an official national flag to fly on St Patrick's Day. The move follows a review of flag-flying practices ordered by Brown when he became prime minister. In response to the question from Michael Jeans on whether the leaders back the Pope’s visit to Britain? Jamie Lindley last night appeared at the Soup Run. It was his first experience of receiving coffee and sandwiches at the Peace Statue. Evicted after an argument and fight with an overbearing and violent landlord, his slide into homelessness was quick and sudden, demonstrating just how precarious having a roof over your head can be, in Brighton and across the United Kingdom. "My girlfiend," he says, "is still at the flat in Hove. We've been living there for 6 months, together. She is studying to do childcare, which is very brave, I think, after all we've just been through. She recently suffered a miscarriage." 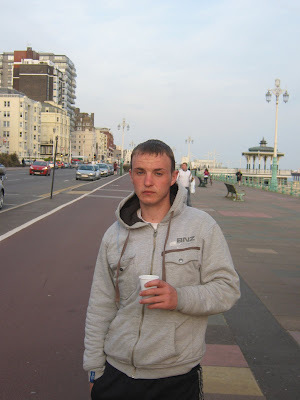 It was over a nasty comment by his landlord that an argument and fight broke out between Jamie and him. ...I won't buy any Porsches or places abroad with donations, like Blessed Teresa of Calcutta did...er, not. UPDATE: I have had 4 kind offers of donations already! No, seriously, thank you to all who have donated and have kindly pledged offers to help buy a camcorder for Catholic blogging purposes. I'll keep you in my prayers. Well, if anyone reads this blog, they must know by now that I'm a budding amateur journalist. I am interested in Catholic news at a national level, of course, but I live in Brighton and am interested in local events, news and people whose lives touch upon some of the most important aspects of the Holy Faith. My primary motivation for this blog is to defend Holy Mother Church in increasingly secular times. At times I allow my more self-indulgent side to take over, I admit, but I sincerely wish for this blog to bear witness to Our Lord Jesus Christ, His Truth and His One Holy, Catholic and Apostolic Church. By trade I am a gardener and work is picking up gradually. However, I am not able, currently, to afford a digital camcorder which costs £129.00 from Argos in a one-off payment. If the dictatorship is of relativism, then the insurgency is one of magisterial intolerance. Does God exist? If so, has he revealed Himself? If so, in what does that revelation consist? These are questions which have objectively correct answers. If God exists “for me” but not in reality, then He does not really exist. We should want to know the truth about this because we are designed for the purpose of hunting it down, which is why Pius XII said that in this way a human wins “enlargement of mind”. We should rebel against the dictatorship of relativism because it aims to deprive man of his right to know his end, the purpose for which he was created, the Truth.